Pasta recipes are always a great hit at my home and can find at least once a week in dinner menu. My little one is a great fan of creamy pasta recipes. 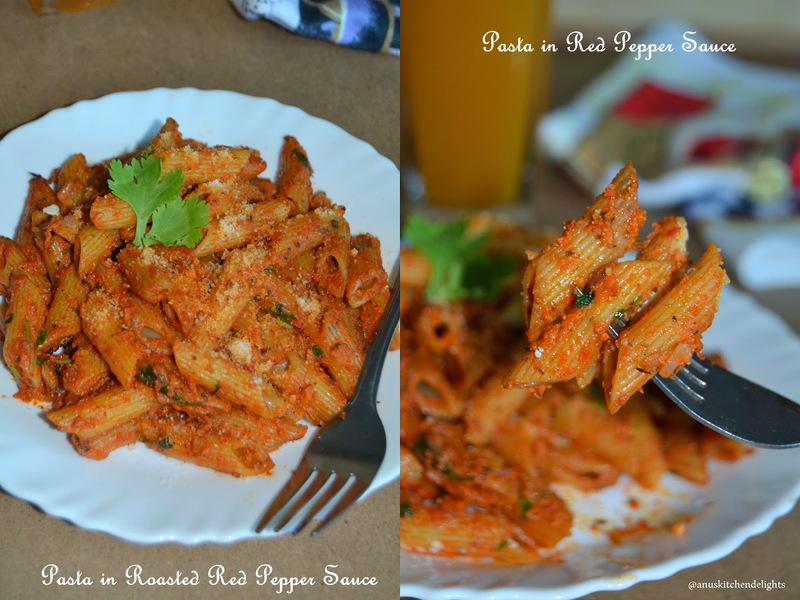 This is an easy pasta dish made with roasted red bell peppers and is incredibly creamy and rich in color. I have tasted pasta recipes in pizza hut and have wondered how they get such a beautiful orange color pasta, until i came to know that the secret ingredient is red pepper. Red pepper can be used to make many condiments. This creamy sauce is excellent to go with any type of pasta. I have used penne pasta to match with it. It can be a great dish for a casual dinner or for entertaining guest at home. Always serve it hot. Preparation time: 10 mins | Cooking time: 25 mins | Recipe cuisine: International | Recipe category: Main course. 1. Boil the pasta in enough water until soft with salt and 1 tsp oil. Once done drain it and keep aside. 2. Heat a pan a drizzle some oil and roast the garlic and tomatoes until soft. 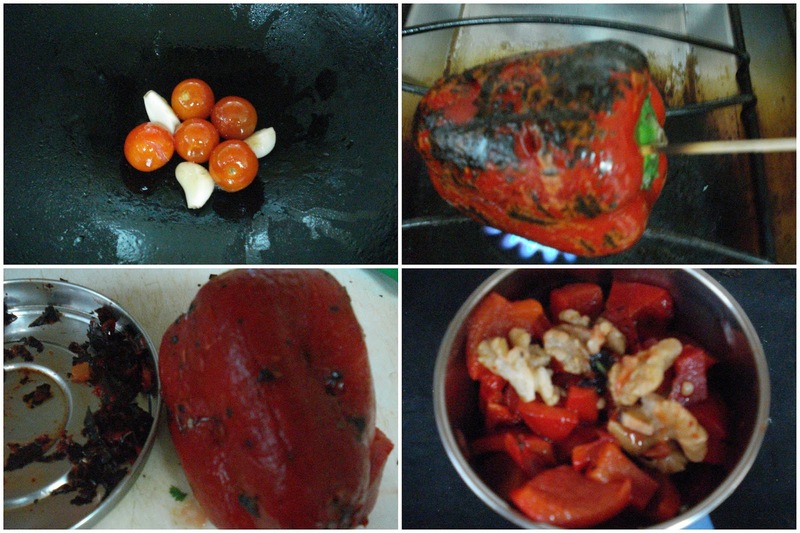 Take the bell pepper, brush with little oil on all sides and roast it on direct flame until black spot appears on all sides. Peel the skin completely and chop them roughly. 4. Heat a pan with little olive oil and saute onion and garlic. 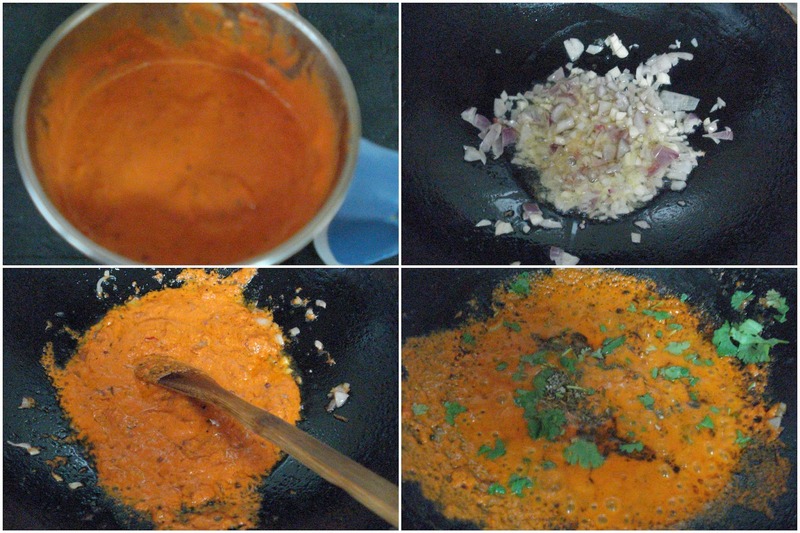 Add the red pepper sauce along with little water (1/4 cup) and bring it to a medium sauce consistency. Throw in the herbs, chili flakes and season it with more black pepper. Adjust the salt accordingly. 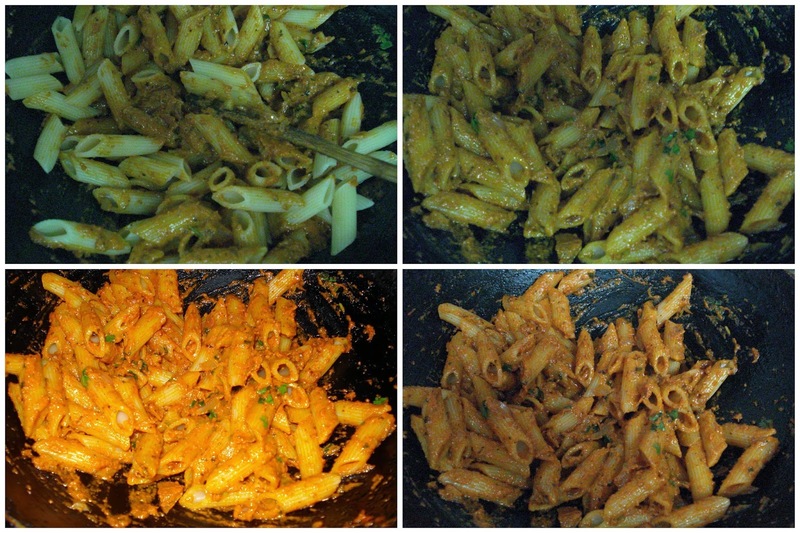 5.Add the cooked pasta and mix well until it incorporates with the sauce. Garnish with chopped coriander leaves and parmesan cheese and serve hot. The original recipe calls for pine nuts(normally used in most Italian dishes) which is replace with walnuts. You can also use almonds or roasted peanuts. It gives a rich creamy texture to the sauce. Adding Parmesan cheese is optional. I used cherry tomatoes, so used 5 nos. Hi Friends! Thank you all for visiting my blog. Without your comments and suggestions nothing is complete which is highly appreciable. Roasted Makhana - Spicy Roasted Foxnuts.